What treasures does the Hidden Path hold for you? Insights into the ancient wisdom of your craft- a beautiful way to align with mystical realms and magical energies- a powerful tool for receiving guidance about the possibilities ahead on your life's path? The gifts that await are as unique as each person who embarks on the journey. 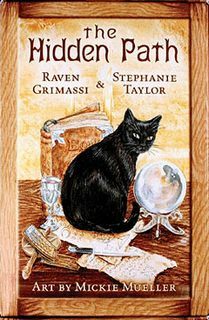 Multi-faceted and magical, The Hidden Path can be used by those on a nature-based spiritual path for divination, pathworking, celebrating seasonal rites, creating ritual experiences, and accessing the hidden Mysteries of the Craft. 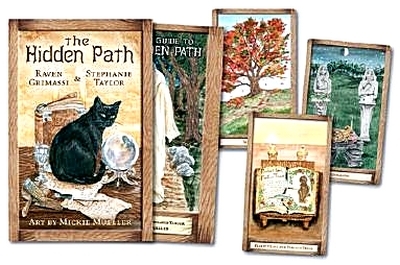 Bestselling Wiccan author Raven Grimassi and High Priestess Stephanie Taylor have collaborated once again with award-winning Pagan artist Mickie Mueller to create these transformative cards that can be used alone or as a complement to their popular Well Worn Path kit. The Hidden Path kit contains 40 cards, a 216-page guidebook, and a black organdy bag.